Derrick Rose addresses the media as camp begins. 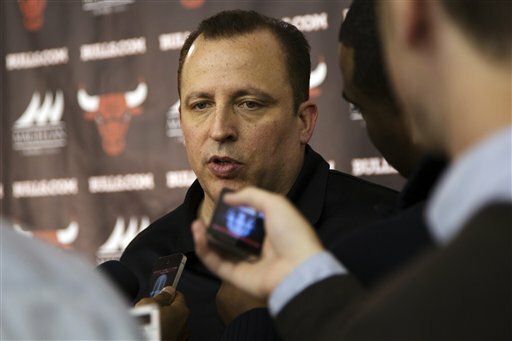 Coach Tom Thibodeau speaks to the media after inking a new four-year deal. Several things are different for the Chicago Bulls from a year ago. There was a lockout for several months, the Bulls came off a battle with the Miami Heat in the Eastern Conference Finals and Derrick Rose was anointed the NBA&apos;s MVP. As you can already see, this year is different — way different. There&apos;s no lock-out this year, so that&apos;s a good thing. But there are bad things, too: Last spring the Bulls stumbled in their first round match-up with Philadelphia and the worst possible injury to Derrick Rose will be felt as soon as the 2012-2013 season opens on Halloween. Rose will not be available for months. He and the team have no target return date, at least they&apos;re not openly expressing one. They can&apos;t, since a setback would cause them plenty of backlash. Rose is rehabbing and expects to start "cutting" during his running in a couple of weeks. The other season-ending injuries included an ankle injury to Joakim Noah and a wrist problem for Luol Deng. Noah didn&apos;t play for France in the Olympics this summer but he affirmed that the ankle is good now. Deng&apos;s decision choice to forgo surgery to play in the Olympics has been a hot topic of negativity for the "talking heads" in sports radio, but Deng had no regrets playing for Great Britain (his adopted country) in the London Games. Now to the even bigger adjustments to the Bulls: Gone is the "Bench Mob" — Gibson and Jimmy Butler are the only ones left. Butler is expected to fill the shoes of Ronnie Brewer. The loss of Brewer is profound for Jimmy; they spent the summer together in Ronnie&apos;s home in Arkansas. If Butler learns anything from his former teammate is a hard and dedicated work ethic. Two other departures that will be a huge hole to fill are shooter Kyle Korver and big man Omer Asik; guard Marco Belinelli and center Nazr Mohammed will handle those roles. So who will fill the role of Rose (not at all an enviable spot)? Former Bull Kirk Hindrich. Rose said he "recruited" the former Bulls number one draft pick to return. Hindrich said it really was a no-brainer; he loves Chicago and enjoyed playing here. But he has had health problems the past couple years that will have to be watched. This year&apos;s number one pick was also a point guard, Marquis Teague from Kentucky; the team also signed Nate Robinson. They will out-work their opponents. It is improbable they will have the best overall record in the NBA for the third straight year. Derrick Rose will likely be on the court around the All-Star break in February. Boss Jerry Reinsdorf will likely be the one to give the thumbs up on his franchise player. Fans will complain about Boozer&apos;s defense. Coach Tom Thibodeau will earn every penny of his new contract extension as he massages this team without his All-Star. He deserved the new deal and he had no doubt that it would happen. At least they will have a full month of a training camp, something that hurt the league last year with the crammed schedule.